« Shanghai Disneyland recap coming soon! I was in Penang over the weekend, a short trip to explore a small-ish city I’ve heard a lot of good things about. I also wanted to check out all the hipster cafes that seem to have sprouted all over George Town in the last couple of years. I wasn’t expecting it to be such an postal-filled trip! I saw no less than eight (eight!) different types of postboxes in the weekend I was there. Malaysian postboxes are generally quite squat, and the slots are for mail being sent within the state and mail for everywhere else, including overseas. BUT, to my excitement, I spotted two old UK-style pillar boxes! And both were in great condition, and still working postboxes! This pre-WWI postbox was in great condition along a pedestrian-only part of Jalan Penang, directly opposite the Eastern & Oriental Hotel. It’s well-maintained, and the cypher of “GR” (George Rex, otherwise known as King George V, who reigned from 1910-1936) was in great condition. Incidentally, the E&O was founded by the same Sarkies brothers who helped make Raffles Hotel in Singapore a success. If you’d like to find out more about their shared history, I can recommend the Oct-Dec 2014 issue of BiblioAsia. A beautifully preserved colonial-era postbox opposite the E&O! It’s still in use. Look how clear the royal cypher is – I didn’t see one this well maintained even in the UK. The next day, I stumbled upon a Victorian(!) postbox at The Whiteaways, a colonial-era shopping arcade in the heart of historical George Town. I spotted it from across the street and just had to see it. I’m not gonna lie, my heart actually skipped a beat when I saw it because look at how beautiful it is. The cypher is still so sharp, and it’s in absolutely fantastic condition! It’s just so rare to see such pillar boxes in the former UK colonies! Especially considering that Malaysia’s been independent since the late 1950s, several years before Singapore. 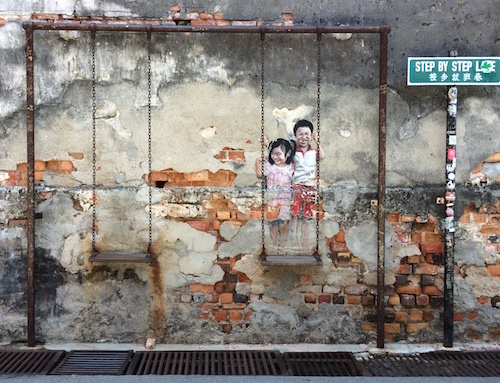 It’s just so awesome to see evidence of Penang’s rich history around. In Singapore, we removed the cypher upon independence but I think we kept using the red pillar boxes for a while. 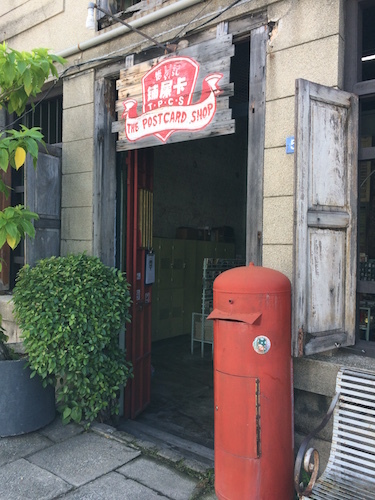 The last operational colonial postbox is outside the Singapore Philatelic Museum. It’s an unassuming shop along Gat Lebuh Chulia, deep in the historical (and hipster) quarter of George Town. I couldn’t quite figure out where it was, but I stumbled upon it while I was looking for a street art! It’s just around the corner from swing mural. TPCS has a huge range of postcards and most of them have a distinctly Penang twist. It’s all a mix of modern photography and vintage-style prints, and of course they also have the touristy types. 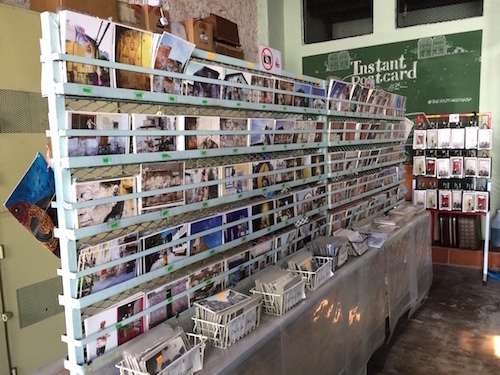 This is a great place to pick up postcards of the quirky, cheeky side of George Town. 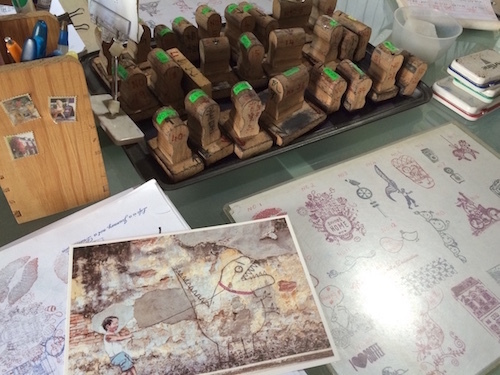 If you buy the postcards, they’ll let you use their range of very cheerful ink stamps to decorate your post. They also sell postage, and they’ll even help you mail the postcards! Decorate your mail with their fun ink stamps! You can find The Postcard Shop at their Facebook page to see some of their wide range of postcards! At the end of the day, I’m quite fond of Penang because of the amazing food and also, it feels like what Singapore could’ve been, if our cultural awakening had come a few decades earlier and we hadn’t torn down so many old buildings in the name of progress. There’s a deep respect for George Town’s history, even though the shophouses and buildings have been renovated and repurposed over the years.